Thinking about the size of an outdoor fireplace is important. A large structure like this one needs an open yard and tall trees for the scale to seem appropriate. Breckenridge Landscape in New Berlin, WI. 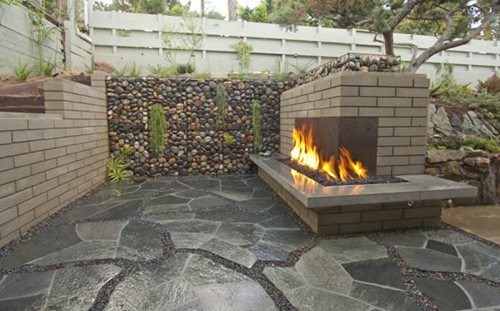 Gas fireplaces can be built in smaller sizes that won't overpower a modest yard. DC West Construction in Carlsbad,CA. 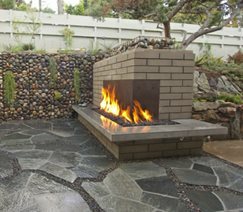 Backyard fireplaces can be created in a variety of sizes according to your needs and the scale of your yard. Generally, wood burning fireplaces tend to be taller and wider than gas fired ones because they require higher chimneys for safety and larger fireboxes to accommodate logs. Gas fired fireplaces are shorter because they have exhaust vents that make chimneys unnecessary. 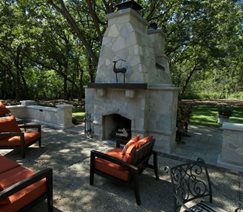 If the main reason for installing an outdoor fireplace in your yard is to create ambiance than you should opt for a small style. A small fireplace will still provide dancing flames but will require less maintenance and be more cost effective. However, if you are looking for a fireplace that provides a great deal of warmth and is more conducive to entertaining go with a larger style. Additionally, take cues from the fireplace's surroundings on how big it should be. For example: if you have a large house with mature trees, a patio cover, and swimming pool then you should consider a bigger fireplace. 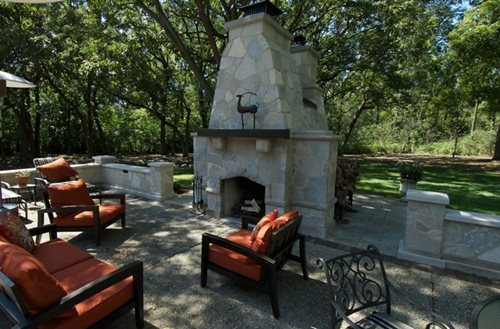 Outdoor fireplaces can be as small as four feet tall, three feet wide and two feet deep. While larger fireplaces, complete with mantel and hearth, built-in seating and wood storage boxes, can be as large as 15 feet tall, 15 feet wide and 4 feet deep. Talk with a landscape designer or contractor to determine what size will best fit your needs and available space. Pro Tip on Entertaining a Group: Large groups of people will require a grander scale as people tend to gravitate to the front of fireplaces, especially in cooler months. For large groups of people, you might even consider two fireplaces at opposite ends of each other to help distribute the volume of people over a larger area.